Jacquet's follow-up to March of the Penguins is beautifully shot but the impressive photography is overshadowed by a mawkish and frequently dull plot. 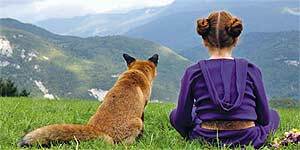 March of the Penguins director Luc Jacquet's second film is another anthropomorphic adventure in which a 10-year-old French girl (Bertille Noel-Bruneau, dubbed by an unnamed English actress) encounters a fox in the woods near her home and decides to befriend it. She spends almost a year tracking it and getting it to trust her, only to realise there's a reason foxes don't make great pets. The film is beautifully shot with gorgeous cinematography courtesy of Gerard Simon, who puts the stunning mountain landscapes to excellent use. It also has a decent score and a couple of the scenes are genuinely exciting, notably a sequence with the fox being chased by a wildcat and a scene where the girl rescues the fox from a pack of wolves. Similarly, Bertille Noel-Bruneau gives a decent performance and all credit must go to the fox-wrangler, who gets an impressive array of performances from a number of different foxes. However, the final scenes are surprisingly shocking, so be prepared for tears if you're bringing small children. The film is narrated by the girl as an adult (Kate Winslet), which makes the entire film feel, disconcertingly, like Kate Winslet reading you a bedtime story. Unfortunately, it's the sort of bedtime story that will quickly put you to sleep, as it's frequently dull and full of tedious repetition. Aside from its mawkishly sentimental storyline (which hopefully won't result in kids trying to befriend urban foxes), the film adds some suspiciously incongruous details – for instance, are there really brown bears, wildcats and badgers in the French countryside? In short, this is beautifully shot throughout but is badly written and frequently boring. Watch some David Attenborough instead.